Dominique Burgeon, Director of FAO's Emergency and Rehabilitation Division, describes his recent visit to South Sudan: "On 20 March, as part of the Emergency Directors’ Group, I had the opportunity to visit Internally Displaced Persons (IDPs) in Nyal, Payinjiar County of Unity State – a state that has been badly affected by the recent fighting in South Sudan. At least 35 to 40 000 IDPs are sheltering on 20 small islands around Nyal, having fled their homes, and coming from as far away as Malakal, Bentiu, Leer, Bor and Juba in an effort to escape the violence that broke out on 15 December. First, we visited an area where residents are still slowly recovering from the effects of last year’s massive flooding and who have since had their few possessions looted and 6 500 head of cattle stolen. They told us how eager they were to start planting in the coming season, but lack the inputs they need to do so. Travelling for 40 minutes in a canoe we then reached an island hosting 2 000 IDPs. Immediately, we could see the devastating conditions in which they were living, but it wasn’t until we spoke to them that we began to understand the true magnitude of their despair. I spoke to Nyawuok Jiech, who fled her home and village in Jau, along the Sudanese border when it was attacked. Her husband and father were killed and she escaped with her seven children and her mother. They walked for four days until they reached Parieng and then continued walking for a further 20 days until they reached this island in Nyal. They have nothing – no possessions, just one another. When we met the family, they were sitting under a tree in the middle of nowhere – this is where they live today. There is no shelter, no mosquito netting, no sanitation and water comes from the surrounding swamps. Above all, there is no food at all. When we arrived they were scavenging palm nuts from the trees. For Nyawuok, however, this is better than her home; at least she feels safe here… for now. Another of the IDPs was an elderly woman named Regina Thot Ryat, who had walked for nine days from Bentiu with four of her grandchildren and three orphans in her care. She has no news about what has happened to any of their parents. She too has nothing – they are relying on wild roots and lily flowers for food. A 13-year-old boy, named Dakar, is sheltering on the island with his mother and four siblings. Their father had been killed and they are doing their best to survive. While their mother was trying to prepare a meal with wild foods, he was attempting to make nets to fish in the neighboring swamps from pieces of string he had found on the island. Rebecca fled the fighting in Bentiu with her five daughters, hoping to find refuge in Leer. However, when the violence spread to Leer she was forced to escape again. In Bentiu, Rebecca was the State Minister for Gender and Social Welfare. Now, she is just another IDP, another victim of the conflict in South Sudan. She told us that she and her daughters have not had a proper meal in more than two-and-a-half months. These were just a few of the heartbreaking stories we heard. And yet, despite the horrors that they had seen and the struggle they were facing to just survive each day, it wasn’t anger that they expressed but rather a sense of despair and resignation. When we asked if people were dying from hunger, they said yes, but people do not report these deaths as they still have their pride and their dignity, no matter how destitute they are. Food, shelter and non-food items are urgently needed here. 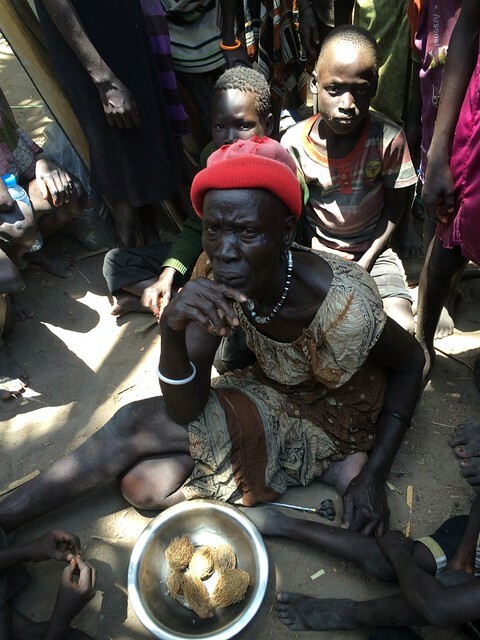 But the IDPs also told us they want fishing gear and seeds and tools to plant in the lands surrounding them. They want to be able to produce their own food and build their own lives… They want to maintain their dignity despite displacement and violence. We need to help them NOW. It is clear that this situation could quickly turn into a catastrophe if nothing is done. We need to move fast – there is no time to waste to save lives in South Sudan. Meeting these families, it was hard not to reflect on the fact that we all live on the same planet, that it is 2014, and that there is no good reason for anyone to live in these conditions. For anyone to be struggling to survive the day."